The suppliers listed below are in no way affiliated or endorsed by Waka Ama NZ, this list is solely for your information. AEROFAST Marine Range offers a huge selection of quality tiedowns suitable for a wide variety of applications, including over centre (gunwale), transom, jet ski, kayak/canoe and roof rack tiedowns. A wide variety of widths, attachments combinations, lashing capacities and materials, including stainless steel providing a complete marine tiedown range. and Philips Automated External Defibrillators (AEDs). Made by master canoe builder Yvon Faaite, the ARE V1 canoes are now available to you direct from Tahiti. Each canoe is custom made for you with your choice of construction (Fibreglass/S-glass/Carbon Fibre). Blackhawk Gazebo specializes in design and manufacture of high quality pop-up gazebo's, flags & banners. We have been steadily suppling happy customer all over NZ and the Pacific for over 10 years. Backed up with our 100% Blackhawk satisfaction guarantee we ensure to keep our customers happy. New Zealand’s only licensed importer of the Concept 2 indoor rower. Indoor rowers available to hire or purchase. Stand Up Paddle and Outrigger Specialists – Sales, hire, lessons, repairs. Authorised resellers of Kialoa Paddles, Paddlesurf Hawaii, C4 Waterman, Hinano Clothing and more. and gain strength. Buy online, free delivery to your door! Rotorua based Expand a Sign is an industry leader in portable and brand advertising with a wide range of teardrop banners, pop-up and folding banners, trade booths and gazebos, backed up by a 2 year hardware guarantee, you know you’re buying quality. We invented the Flying Banner / Teardrop Banner, pop-up A-frames, Wondasign and continually work on improving our existing products. Expand a Sign are happy to create a written quote for you if needed for funding purposes. Our Clothing brand is unique to NZ and paddling community. Custom Va'a Outrigger Canoes made in Tahiti available to order from New Zealand. We deal with shipping and customs, you pick your Va'a in Auckland from us. Try the V1 that some of the best Tahitian paddlers train and race on. Our key aims are to build and supply quality and affordable outrigger canoes to local and international markets. We can build S-Glass, Carbon Fibre, performance canoes for racing and training. To place an order for your custom built v1 canoe contact John Papalii. double angles (bends), steering and keiki paddles. These paddles are all handcrafted. Contact me for club/team paddles, or custom lightweight models. We believe Greyman Fitness Solutions is the number one cross training gym in the country that caters for all levels of fitness. We pride ourselves as the one place where we deliver leadership and motivating style training sessions where no day is the same. We are the only gym in the country that is specifically set up for paddlers mainly from Outrigger Canoeing/Wakaama and Stand Up Paddling back grounds. For more information on how to join, the services we offer or to enquire about any products we have in store, please contact John Papalii. Kapinua can provide your team with your fully sublimated custom team wear. All sublimated garments are proudly made in Levin, NZ. No minimums. We are happy to do your one off shirts for those last minute team members. MedalsPlus specialises in supplying customised medals, pin badges and other related products – primarily to New Zealand sports and events organisations. World class medals and more, exceptional design, best quality, great service and unbeatable prices. MedalsPlus is part of Total Ventures Ltd – a small family owned and operated New Zealand company. Great selection of paddles to fit every need. Scorpius: more volume for the larger paddler and designed for big surf. Hurricane: successful all round canoe. Pegasus: successful all round canoe for lighter paddlers. Hurricane Tempest OC2: This canoe will change will the concept of a standard OC 2, and will give any riders hours of great paddling. Oceanrider provides performance wear specially for all who spend their days in, on or by the water. Travelling, exploring, competing, training or performing, Oceanrider reflects the lifestyle, commitment and culture of water sport athletes in Aotearoa and the Pacific. A brand that is unique to New Zealand and identifiable world wide. Waka ergometers for indoor training. Our ergometers are designed for high input from experienced through to novice paddlers, and can handle multiple users in gyms, clubs and at home. The ergometers are made of extremely robust steel construction and easy operating mechanisms, to allow for easy use and adjustment. They are fully performance calibrated and give the same “on-the-water” feel as real paddling. They come complete with an adjustable shaft, variable paddling resistance, fully fitted with an EZ-adjust, quick release footrest, and adjustable height and angle seat, including a large visible on-board console display. All ergometers can be connected to a big screen to have “virtual lanes” for group races – great for inter club time-trialing and promotional events. Rash tops, paddle bags, buoyancy aids, dry bags, gloves, neoprene shorts, paddle jackets and a whole range of other items. Check our online shop. Suppliers of paddling gear including team uniforms, Sharkskin™, StandOut™, ODS Hardware, Dolfinpacks™ and more. We’re always on a journey to find fresh and innovative product to keep us in action on and around the water… But of course some of the gear we find is going to excite even the general outdoor warrior too! Let’s just get out there and embrace nature’s playground. Check us out on www.paddletech.co.nz and like our Facebook page @eat.sleep.paddle.repeat for updates. Supplier of premiere outrigger canoe & SUP equipment & accessories. Distributors for Viper Vaa, 425 & Marere Tahiti Paddles, ARE VAA & Tehuritaua canoes. From the humble beginnings of a small operation in a very small Gisborne shed, Sonic Surf Craft has evolved into a successful company that provides Surf Craft for people all over the world. From equipment for the next generation of surf sports stars through to the sports current elite athletes, we’ve made a real name for ourselves as one of the leading manufacturers of SLS equipment in the world. We’re enjoying a great time at Sonic Surf Craft and we’d love to have you along for the ride! designed by paddlers for paddlers. Trading as RFD New Zealand, we offer affordable high quality buoyancy aids, lifejackets and waterproof tops from well-known brands such as RFD, Crewsaver and YAK. We can assist you with any queries you have on safety equipment. We can also provide you with Inflatable boats and motors. Va’a Factory NZ is a proud supplier of Tahitian made Va’a Factory V1, V3 and V6 Va’a. Designed by renowned Tahitian paddler Lemmy Lambert the Va’a Factory V1 ‘Orca’ is an update on Lemmy’s original V1 and still manufactured in a family run workshop in Papeete. We want to bring high quality Fibreglass, Coremat/s glass and carbon V1 within reach of everyone’s budget. Also stockists of Knysna V1 foot pumps, Moro and Huahine paddles and a range of Va’a Factory apparel. Check out our facebook page for updates on Va’a Factory adventures and products. We are a New Zealand owned company who supply accessories, clothing apparel and tahitian built va'a. that will suit all levels of paddling, from our Juniors and beginners to our more skilled level of paddling. Removable Rack options available to increase your load. Custom Design to suit your Club Needs and Written Quotes supplied. Visit our website for photos. Online store for clothing and accessories essential for paddling. Checkout our range of Adrenalin 2P Thermo, neoprene and lycra paddling clothes, leashes, on-deck storage solutions and more. Waka Solutions providing quality, affordable, durable paddles & paddlebags. NZ distributor for Brad Gillespie Paddles. Catering for all types of groups and people, school kids, adults, experienced paddler! Great deals! 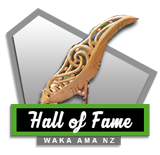 We also deliver waka ama programmes to schools, communities and team building activities. Join us today and experience the wave of waka ama! We custom make outrigger canoe paddles to feature original designs and options. We have a keen interest in being there to help develop the sport of Outrigger canoeing and train and participate in regional and international events. To place an order for individual or team sets contact John. Zulu Outriggers are the Proud manufacturer of V1's, OC1's and OC2 canoes . Mark Kennedy, who has over 19 years work within the industry. recognised for its durability, performance and quality.